Its home is the road. 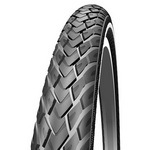 Although the fast, sporty, tread-less slick weighs just 230g it still has a RaceGuard protection belt. Who loves ya baby? Replacing the Stelvio for 2010, the Kojak is the fastest tyre ever fitted on the Brompton; lighter and more puncture-resistant (thanks to a RaceGuard strip) than its predecessor, a Kevlar bead also allows it to be folded, making it easy to pack as a spare. Finished with reflective sidewalls.